For four generations our family, the Scott’s, have been farming in Lucama, County Wilson, North Carolina. Today, Scott Farms Ltd grows soybeans, wheat and of course our delicious sweet potatoes in the warm, fertile North Carolina soil on our 5,000 acre farm. My own father, Sonny, first began farming sweet potatoes way back in 1983 and we now grow them on a 1,900 acre plot at the farm. I oversee the growing, packing and shipping of our sweet potatoes, which means I can personally guarantee the quality of each and every one, from seed to shelf. 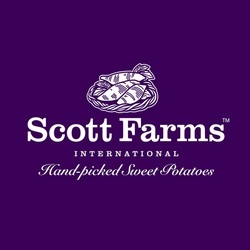 In 2005, we formed an international branch of the company, Scott Farms International, and we’re now the largest importer of sweet potatoes to the UK and Europe. We’ve also launched the Love Sweet Potatoes campaign as a way of educating the public about the nutritional benefits of sweet potatoes and the many different ways they can be eaten. Nowadays, we ship our sweet potatoes to the UK, where they’re turned in to our delicious sweet potato chips. We hope you enjoy our chips as much as we enjoy growing our sweet potatoes!